The energies of our New Grid (Humanities) being formed has been going day and night for (roughly) around 3-4 days/nights very intensely. With lots of ‘full on’ energies and ‘dreams’ at night…as we are doing so much ‘above’ and healing and releasing so much of the old – Double. Feeling here but not here in a bit of a ‘dream’ state or dizzy while away. Feeling super dehydrated and headaches. Many are so very tired due to this ‘Double Shift’ we are feeling and transmuting in creating our new Grids…and we just had to lay down and rest and sleep as this recalibration has been going on, this phase of the New Grid. Also many time line shifts are occurring as well…where you may see someone walking by that at first glance thought you saw someone from your past/from another time in your life…that has been very interesting. As this happened today with my son and I both as we were sitting outside and watching people walk by and we both shared who we saw and thought at first glance they were. THESE ENERGIES JUST EASED DURING THE FORMING OF THIS POST – which is very indicative of bringing through these energies in the vibration of this article…as this JUST happened …as I had a ‘rest’ mid-way of writing this at around noon here in Australia when these energies eased, phew!! As what I didn’t share that I saw today, earlier on, I am now able to share….that as being part of the New Grid and my Soul and Spirits placement/anchor in this (of linking our Soul to our Spirit as a Trailblazer) I could see a white line (New Grid Line-corner piece) running in front of me, behind me, to the left of me and to my right, like a white cross. I am feeling so excited right now! To be out of these 3 day/night energies as I could barely function, yet one learns to ‘soldier on’ as remember we are feeling these in our Soul in our Human Bodies and in our Spirit as well, it was Double..hence my relief and joy ;-). So this is a new anchor point in the New Grid, a corner ‘piece’ to connect up to all other corner pieces, as this will grow and grow and spread out further and further. Remember this is first hand as it is happening and so what this means further I will bring as it comes as it happens in REAL TIME. Just know this is very exciting. So hold on and hang in there as we form our new paths…as we create new past, present and future, forward and behind, like a piece being put into a very new slot with Divine White Light radiating out in four directions. As it is a tingling and enlightening feeling and very exciting…and at any stage, we will definitely take that…enjoying the moments as we go along. This is very real, this is really happening. 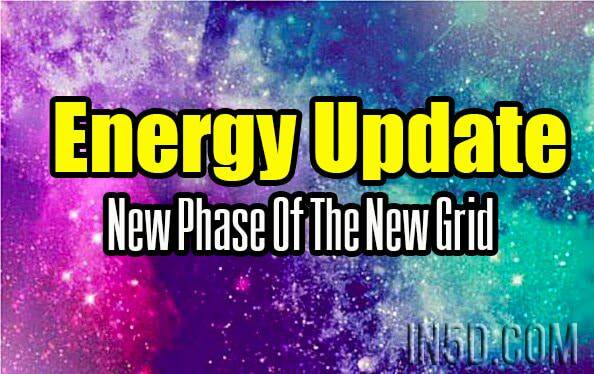 I am working closely with Katie IndiCrow who is also clearing Grid lines with Gaia with these New Grid energies and she has some wonderful videos out about what she is also doing. As the time for us to link with others to do this together (yet separately) is very much here and we will be sharing new videos about this soon. So where ever you are at and what ever you are going through this new placement of recalibration of the New Grid IS HAPPENING. Part 8 is now being written and will be shared very soon, as I am still adjusting to what has come after writing this. Anastacia takes on clients for 1:1 sessions. To book in, please contact at: theoraclespeaks@bigpond.com or for further information please read the pinned post on the Blue Beyond. Anastacia is a Rainbow Bridge in linking our Soul to our Spirit of 6D and 8D -through our Emotions of the Divine – sharing from experiencing energies herself and feeling the energies through her two souls (human and spirit) as they come to our planet. From 20years of personal experience in linking her soul to her spirit, through her emotions this lifetime and past lives – back to Source through the ‘abyss’ – in service to Humanity and Gaia Guiding/Teaching Humanity. From the Ancient Ones, Shaman, Blue Ray Elder, Pleadean, Lemurian, Atlantean, Arcturian, Lyran.